Featured in Food Enthusiast Magazine! Although Laughing Glass is perfect simply served over ice- listed below are two of co-founder and resident mixologist Jill Korst’s favorite recipes to spice up your Cinco shin-dig or keep on file for summer barbecues and get togethers. In a glass, muddle the mint, and watermelon (I use a wooden spoon). Add the Laughing Glass Cocktails Margarita and stir to mix. Add ice, the soda or sparkling water. Garnish with a slice of lime and mint leaves, if desired. For the simple syrup: Combine the 1 cup water and 1 cup sugar in a small saucepan with the chopped rhubarb (3 rhubarb stalks, cut into small pieces). Bring sugar and rhubarb to a rolling boil and let cook for 10 minutes until the sugar is dissolved and the rhubarb has released its color and flavor. Remove from stove and set aside to cool. In a separate glass combine the Laughing Glass, Cointreau, club soda and simple syrup. Shake in a cocktail shaker for 10 seconds and then serve. Cinco de Mayo (May 5th to us gringos) is just around the corner and you know what that date in history marks don’t you? That’s right! 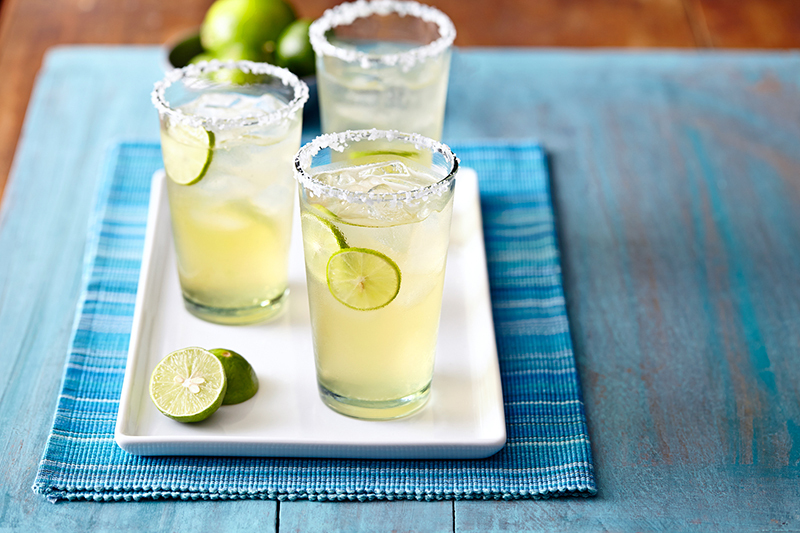 It’s the one time of the year when we can drink, guilt free, as many margaritas as we want! I’m not a great margarita maker yet I detest those cloying, pre-made mixes that stick to the back of my throat. Gag! So when I heard about Laughing Glass Cocktails, an all-natural, ready-to-serve (and drink) margarita that contained only fresh quality ingredients, my lushy senses spiked. Launched in 2013, Laughing Glass Cocktails was the idea of three girlfriends, Sydney Rainin-Smith, Jill Korst, and Carey Clahan, who had a passion for entertaining and were driven to create a product representative of their good friendship spiked with the love of a good and good-for-you drink. The product’s distinctive tequila blend is produced by an artisan distiller in Tequila, Mexico and is formulated with the best agave pinas grown in the lowlands of Jalisco. The tequila is aged and fermented in allergen-free stainless steel casks, and then is distilled and filtered six times, resulting in blanco tequila of the purest form. It also happens to be gluten free, non-GMO, vegan and PALEO friendly while containing only 110 calories per 4oz serving. Now that’s some guilt free drinking DNA! As someone who appreciates a laugh-your-glass-off night with friends, as well as a good and good-for-you drink, I think this margarita is worth a toast any time of year. The three margarita mavens behind Laughing Glass Cocktails were kind enough to play Foodie 5 with us. 1. What is your favorite food or drink memory from childhood? Jill: I love our family summer ritual of eating lobsters in Maine. It’s just not summer without a traditional lobster bake. Carey: My mom used to make a cheesy chicken and broccoli casserole with curry sauce – that was what my brother and I would always request for our birthdays. Sydney: Baguettes with tomato and avocado sandwiches and the best bottle of Sauvignon Blanc we could find and afford at the time while backpacking through Europe when I had just turned 18. 2. You’re moving to a new bar in minutes and can only take one gadget along with you— What do you grab and why? Jill: My muddler. There is nothing like the flavor fresh fruit and herbs impart. Carey: I’ve just gotten into the giant spherical ice cubes lately. That’s not really a gadget, but it is a fun new product. I love how the simple purity of ice can have an impact. Sydney: My shaker. Life is always a bit better when you shake things up a bit! 3. No one’s looking —what is your secret food fetish? Jill: I am a sucker for Maraschino Cherries. I love Luxardo cherries imported from Italy. Carey: I put soy sauce on my popcorn. It’s amazing! Sydney: I love to put mounds of butter on my warm rice! 4. Fill in the blanks: “I’d like to see more _____ on bar menus and a lot less flavored _________. Jill: I’d like to see more innovation on bar menus and a lot less flavored liquors. Carey: I’d like to see more simplicity on bar menus and a lot less flavored vodkas. Sydney: I’d like to see more “Laughing Glass Cocktails” on bar menus and a lot less sugary sweet drinks. 5. Congratulations, you have won Carte Blanche to drink and dine in any country/city in the world! Where would you go and why? Jill: I am so blessed to live in the San Francisco Bay Area, one of the best cities in the world for eating. It’s hard to top. Carey: Hong Kong! There are streets there that have every cuisine imaginable, one restaurant after another. An Aussie steak house next to a Nepalese bistro across the street from a Spanish tapas place. My stomach is growling just thinking about it. Sydney: Florence, Italy. I have a deep love of Italian food and the way the Italians savor their meals, their fine wine and cocktails, and their friends and family. San Anselmo, CA —December 4, 2013 — The three friends have always joked they should mass-produce their famous margarita recipe. Laughing Glass Cocktails, the new startup founded by three girlfriends, mixes and bottles authentic ready-to-drink cocktails using only super premium ingredients. The company rolled out their first product throughout Northern California this summer, and bottles are now hitting store shelves in Southern California. The low-calorie Margarita is made from just a few natural and organic ingredients and tastes just like you made it at home— not like something out of your medicine cabinet. Adding a minimum of ingredients and nothing artificial, Laughing Glass created the first authentic ready-to-pour margarita in the market. Each batch is made with their own proprietary super-premium Blanco tequila, natural citrus, and lightly sweetened with organic agave nectar to make an unequivocally pure and delicious margarita — with a hint of carbonation. It’s non-GMO, gluten-free and vegan to boot. In addition to retail stores, consumers can purchase Laughing Glass online through three of their retailers, Ludwigs, K&L Wines, The Jug Shop. Distribution will continue to expand nationally in 2014. Available at the following locations in Southern California and San Diego counties, with more locations added each week. Founded in 2012 by three Marin County friends with a passion for entertaining, Laughing Glass Cocktails is an innovative new spirits company creating quite a stir in The San Francisco Bay Area. The founders were dissatisfied with the ready-to-pour margaritas available in the market today. They set out to create super premium cocktails that don’t compromise flavor, quality, calorie count, or ingredients. The first product to launch is their delicious take on the classic margarita. LGC plans to develop additional ready-to-pour cocktails that will always be natural, lower in calories, and authentic. Laughing Glass Cocktails aims to make gatherings effortless, real, and extraordinarily festive. The three Ross Valley moms always joked they should mass produce their famous school-fundraiser margarita recipe. No one thought they would. But last year, Sydney Rainin-Smith, Jill Korst and Carey Clahan, who were up to their elbows in limes for yet another parent-teacher association party, started to get serious. In May, they launched Laughing Glass, a company that makes a low-calorie, organic agave-sweetened premixed margarita. The unlikely alcohol producers, from divergent backgrounds, are realizing the market for their concoction – which they call “something women don’t have to hide in the kitchen” – might extend beyond the PTA. The cocktails are selling out at 50-plus Bay Area storefronts where they are carried, and the founders just ordered a double production run and are getting five to 10 calls a day from grocery stores across the country. “This is a bigger industry and a bigger market than I was prepared for,” said Clahan. “But that’s true of any startup,” added Rainin-Smith. A year and a half ago, the three women – who met at a house party in Bolinas after college and bonded over PTA events – were spending hours juicing and mixing for school events, local fundraisers and Ross Valley house parties when they thought of starting a company. “We wanted to make a premixed cocktail that women can actually use, that they can take to a barbecue and not be embarrassed about,” said Laughing Glass CEO Rainin-Smith, a former voice actor. They ordered beakers and white gloves online. Chief Operating Officer Korst, who previously worked for Joe Biden in Washington, D.C., asked her husband, a mechanical engineer, to set them up with an elaborate Excel spreadsheet so they could play with ingredients while keeping the calorie count low (they ultimately got to 41 calories per 1.5 ounce serving). With the recipe settled, they started looking for a distributor. Discouraged, they called the small and local Monterey Bay Bottling Co. in King City (Monterey County). A woman answered the phone, and Rainin-Smith said she almost cried with happiness. And they officially had a bottling partner. Buoyed, she started looking for a distributor. “These gals call me up one day,” said Ken MacKenzie. “I mean, so enthusiastic. I tried to talk them out of it, and the gals never flinched. He set them up with a small, high-end distillery in the lowlands of Mexico. The founders recently made a trip to visit the distillery and stayed with friends of MacKenzie. This is not the first bottled margarita for a more discerning demographic – Skinnygirl, a low-calorie premixed cocktail line launched by “Real Housewives” star Bethenny Frankel, has been wildly popular, although it was recently pulled from Whole Foods. The Laughing Glass founders could get the last laugh. A friend of theirs recently reported that her husband, on his own, had purchased and consumed an entire 750-ml. bottle one night. “I don’t want to sound like an alcoholic, but yeah, I did,” said Brad Clark, 44, a vice president at Bank of the West, who seemed a little amazed that his taste for the mix had spread around the women’s social circle. At the Jug Shop on Polk Street in San Francisco, warehouse manager Martin Potter said the drink has major fans. The founders meet daily and share Google calendars. (Trying to find a time for a group portrait, one knew when the other’s son was going to the dentist.) “Personally, I think you can work a lot more efficiently when you’re our age,” Rainin-Smith said. Clahan, the former manager for Johnny Love‘s nightclub in San Francisco, pulled another bottle out of the fridge. Marin Company Laughing Glass Cocktails Launches Authentic and Delicious Margaritas —To Go! San Anselmo, CA —JULY 1, 2013 — Laughing Glass Cocktails, the new startup founded by three girlfriends, mixes and bottles authentic ready-to-pour cocktails. The company is rolling out their first product throughout the Bay Area. The low-calorie Laughing Glass Margarita, made from all natural and organic premium ingredients, tastes delicious and has an added twist— a hint of carbonation. Once the distiller was on board, Laughing Glass sourced only the best Agave plants (pinas) from the lowlands of Mexico. After being picked at the peak of their maturity, the plants are slowly steamed, mashed and fermented. Next, the mixture is distilled in stainless steel barrels for a concentrated, pure and clean Blanco spirit. Blanco tequila is not aged in the oak casks that can cause a heavy flavor, or even an allergic reaction in some. Adding a minimum of ingredients, and nothing artificial, the partners created the first authentic-tasting ready-to-pour margarita in the country. “Our tequila is highlighted by a strong floral aroma,” says co-founder, COO and chief mixologist, Jill Korst, “balanced with a smooth, drinkable and refreshing taste making this the margarita for the true tequila lover”. Laughing Glass Cocktails has accomplished what it set out to do—make a classic margarita that appeals to savvy consumers using premium ingredients at a competitive price, while piggybacking on the current trend surrounding convenience. Look for the Laughing Glass Margarita in specialty grocery stores throughout the Bay Area (listed below). Distribution will continue to expand in the west over the summer, launching nationally in 2014. SRP is $17.99. 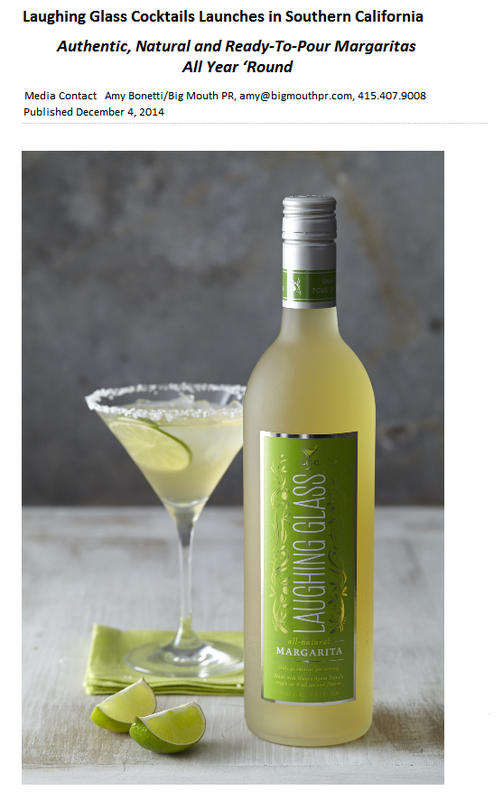 Laughing Glass Margaritas come in 750ml glass bottles using eco-friendly packaging. Andy’s Market, Baggy’s, Beltramo’s, Big John’s Market, Blue Fin Cafe and Billiards, Bottle Barn, Cannery Row General Store, Castlewood Golf Course, Corral Market, Country Corner, Danville Bowl, Diablo Foods, Don’s Liquors, Fairfax Market, Golden Gate Market, Jolly King, Jug Shop, Lagunitas Country Club, Ludwig’s, Lunardi’s, Mill Valley Market, Mollie Stones, Nielsen Bros Market and Deli, Oliver’s Market, Ord Terrace, Paradise Foods, Paradise Market, Piazza, St. Helena Wine Center, Surf ‘n Sand, The Cheese Shop, The Meadow Club, United Market, Venice Gourmet, Whole Enchilada Marketplace, Windmill Market, Wine Stop, Woodlands Market, and Zanotto’s. Beginning with its proprietary, super premium Blanco tequila, it adds delicate natural citrus flavors, sweetened with the subtle taste of organic agave nectar —adding its own unique twist, a hint of carbonation. Unequivocally pure and nothing artificial. LGC Margaritas are 12% alcohol, about the same as a glass of white wine. Founded in 2012 by three girlfriends with a passion for entertaining, Laughing Glass Cocktails is an innovative new spirits company creating quite a stir in The San Francisco Bay Area. The founders were dissatisfied with the ready-to-pour options available in the market today. They set out to create super premium cocktails that don’t compromise flavor, quality, calorie count, or ingredients. The first product to launch is their delicious take on the classic margarita. LGC plans to develop additional ready-to-pour cocktails that will always be natural, lower in calories, and authentic. Laughing Glass Cocktails aims to make gatherings effortless, real, and extraordinarily festive. 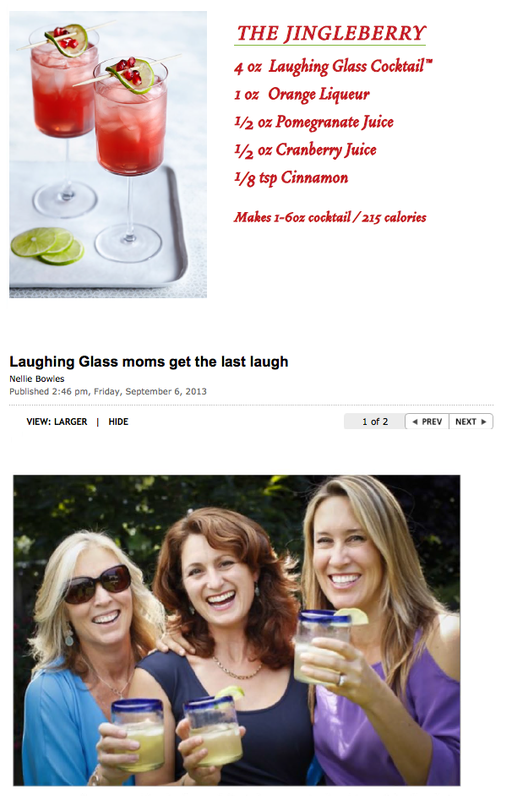 Laughing Glass Margaritas: all-natural and delicious!